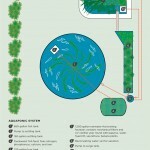 WHAT DOES IT MEAN to try and grow your own fish tacos in an outdoor exhibition space? It means a new kind of farming: one based on experimentation instead of economic viability. It means functionality can be compromised for the sake of concept. It means success and failure can coexist without detriment. Which is good, because you can expect a lot of failure. There were problems right away. The fish pond leaked. “Leaking” turned out to be a vital component of the Vietnamese system — an additional water filtration mechanism. 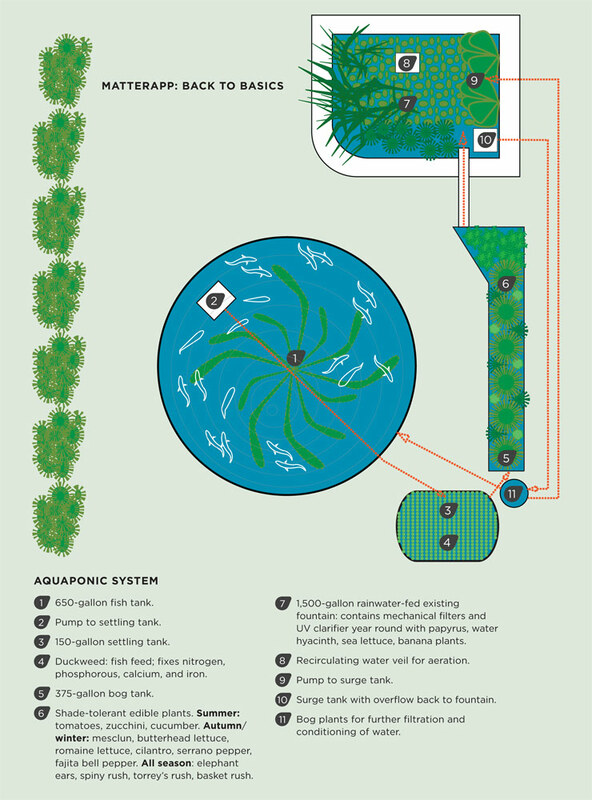 But Vietnam has enough rainwater to replenish such a system, and Los Angeles doesn’t, so the pool needed to be sealed. Attempts to purchase large quantities of live tilapia sparked suspicion on the part of a local tilapia farmer that the artists were actually planning to start a competing farm, so he would only sell them 40 fish, rather than the 400 that they asked for. The taco vegetables — lettuce, onions, peppers, and tomatoes — never grew especially well. 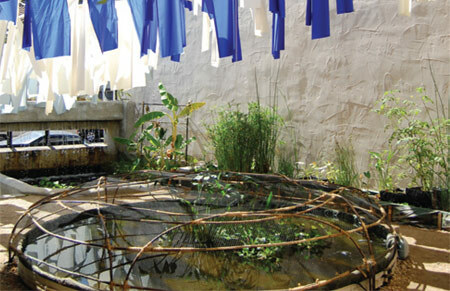 But wildlife was attracted to the habitat, so much so that a dome made of steamed bamboo was added to the top of the pond to keep raccoons and neighborhood cats from eating all of the tilapia. At the end of the party, the surviving tilapia were placed into an aquarium inside a conference room, where they continue to live on, decoratively. What was M&A left with? Among the lessons: Building a food system and its processes firsthand sheds new light on eating and just how deeply strange it is. No matter how much you design something, there is an infinitude of little surprises. And finally: Tilapia make surprisingly good pets. HEATHER SMITH lives in the Metropolitan Museum of Art. Every night, she goes out to scavenge coins that tourists have thrown in the fountain. She is currently working on a book about insects, humans, and the various misunderstandings that arise between them.